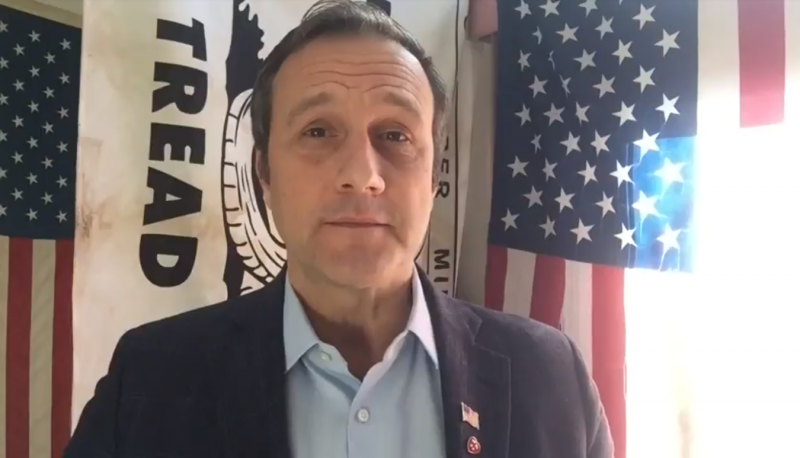 Paul Nehlen, who mounted a Breitbart-backed primary challenge to House Speaker Paul Ryan in 2016 but lost some of his former allies when he started publicly embracing white nationalism and anti-Semitism, has recently lost even his most loyal followers in the racist alt-right after he revealed the identity of a white nationalist Twitter troll. Although Nehlen’s 2016 campaign was backed by prominent right-wing figures like Steve Bannon, he never received mainstream support from Republican voters in his state and ended up with just 16 percent of the primary vote. Nevertheless, Nehlen is planning to challenge Ryan again in August’s primary, even as he continues to steadily isolate himself from former bases of support. In the past few months, Nehlen has been disavowed by Wisconsin’s Republican Party, abandoned by the more prominent far-right activists and conspiracy theorists who once supported him, and declared too extreme for an explicitly white nationalist organization to affiliate with. This week, Nehlen reached a previously unimaginable milestone of alienation, earning the disavowal of many of his once ardent alt-right supporters. On Monday, Nehlen published the personal identity of a white nationalist troll who successfully distributed alt-right propaganda on Twitter during the 2016 election using the screen name “Ricky Vaughn.” Nehlen revealed that the person behind “Ricky Vaughn” was Douglass Mackey, an economic consultant in Brooklyn, New York, in his late 20s. As HuffPost’s Luke O’Brien reports, Nehlen published Mackey’s identity in the midst of an ongoing debate within the white nationalist movement between alt-right activists who want to embrace violent, boots-on-the-ground demonstrations and those who want to advance the alt-right mission by broadcasting propaganda. Since the turn of the new year, Nehlen had come to embrace a faction of the alt-right that is considered extreme even among white nationalists. He appeared on former Grand Wizard of the Klu Klux Klan David Duke’s podcast; befriended Chris Cantwell, a violent, open advocate of fascism who was charged with attacking counter-protesters at last year’s Unite the Right rally in Charlottesville; and promoted the book “Siege,” which contains a collection of Charles Manson’s writings justifying terrorism to advance a neo-Nazi agenda. Nehlen’s publication of Mackey’s real name and personal information not only earned him the fury of many of his former alt-right supporters, it also earned him a (rarely seen) banishment from Gab, an “alt-tech” site that claims it does not censor user content and as a result is currently saturated with right-wing extremists who have been booted from Twitter. Nehlen’s ban from Gab, which was one of the few social media sites he was still allowed to access, leaves him without a viable platform on which to promote his campaign, aside from whatever alt-right grifting YouTube channel would still be willing to host him. But even before this week’s episode, Nehlen had already begun to establish himself as a dangerous liability even for his white nationalist supporters. American Renaissance, a white supremacist publication, disinvited Nehlen from speaking at one of its conferences last month, despite Nehlen’s alleged offer to provide a draft of his speech for pre-approval. But revealing the identity of Mackey lost him even what little support he had left in the alt-right. For those of you asking “what happened” Doxxing ourguys is uncalled for. On Gab, neo-Nazi troll Tim “Baked Alaska” Gionet, who has recently hosted Nehlen on his YouTube channel and defended Nehlen’s anti-Semitic ravings, said the situation was “fucked.” In a YouTube stream last night, Gionet said he could no longer support Nehlen. “Ricky Vaughn was doxed by Nehlen and by [Chris] Cantwell. I don’t stand for that. And I say that with remorse because I actually like Nehlen. I like the guy. He’s a nice guy. He’s a nice guy, so I’m sad to say that, actually. I’m not saying that with glee. It’s like a tragic sort of thing,” Gionet said. 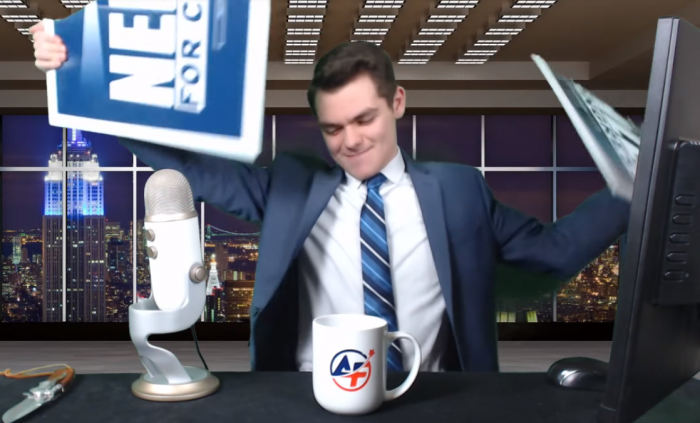 One of the more dramatic disavowals came from white nationalist podcast host Nick Fuentes, who ran a knife through his Nehlen campaign sign during the April 3 edition of his show “America First.” Fuentes referred to Nehlen as “our former friend of the show,” adding that he “used to be a big supporter of him, had him on the show twice.” In addition to the grievances that others of Nehlen’s former supporters have laid out, Fuentes apparently took issue with the fact that Nehlen’s campaign spokesperson was identified as a gay man who was raised Jewish. “He’s a dummy, low IQ. He can’t handle the things he’s learned and now he’s going to dox my friend Ricky Vaughn? He’s going to make us all pay for it? Make us all look like a bunch of assholes?” Fuentes said, before stabbing the campaign sign with a knife and ripping it in half. Chris “Crying Nazi” Cantwell—who now claims to be working as an FBI informant—was one of the few alt-right activists who said that he didn’t “have a problem with Ricky Vaughn being doxed” and instructed his followers to maintain anonymity next time they “have to dox a race traitor” like Nehlen did.